Integrating IT Risk Management systems is critical for organizations who want to secure their IT investments from internal and external risks related to information security, infrastructure, project management and business continuity processes. 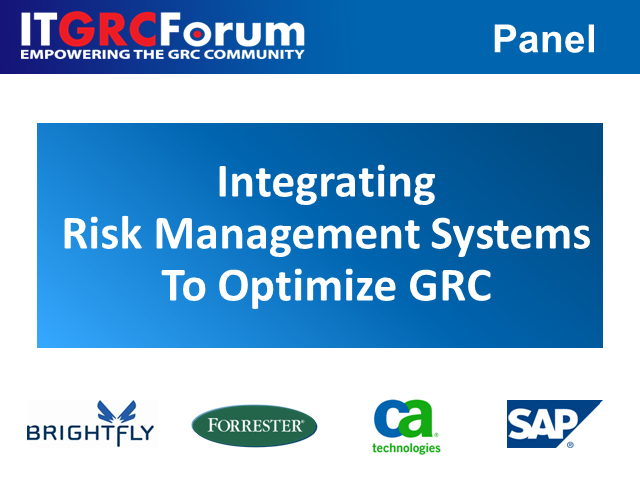 A well defined GRC program based on frameworks such as COBIT and ISO 27002 cannot achieve high maturity scores without integrating risk management systems across divided organisational units. With growing volumes of data, disconnected systems, constantly changing regulatory compliance challenges and a dynamic business climate, gaining a complete view of an organization's risk exposure is increasing in complexity. Organizations are under increased pressure to ensure their compliance mandates are not geographically siloed. For example, a manufacturer may have aggressive revenue goals for an emerging market, but those goals may generate business risks such as not aligning to regional regulations and unintended costs associated with extending the necessary financial, IT and business controls to a remote location. A recent Industry study of 1900 global CFOs and senior finance leaders revealed that risk management has risen in priority by 93 percent since 2005. The survey also noted that two out of three companies had encountered material risk events within the past three years. Unforeseen risk can hurt a company's bottom line as well as its brand reputation so integrating risk management systems across once-divided units and functions is essential to seeing the bigger picture, and will help businesses tackle their complex risk challenges. - What is IT Risk Management process and why is it critical for an organization?